Life begins looking at mother’s face and, this is the face which is the guiding angel of our life. The bond between a mother and her child is the strongest one and instantaneous. Nothing in the world is comparable to it. My mother is the most beautiful woman I have ever seen. Beautiful, not in the sense of physical appearance- there would be millions of women more beautiful than her. But, to me, her face is the most angelic one. Her presence has the magical aura which instantly makes me calm even amidst the strongest of emotional turmoil. Her strokes on my cheeks empower me to stand against every adversity. My mother has a strict personality. In my childhood she was not actually my friend; rather she had the persona of an intransigent teacher. She analyzed my every move, criticized my every work. Sometimes, it disgusted me and often led me to think that she must have found me near the dustbin! How come a mother could be so stringent to her own child! But as I was growing up, gradually she was opening herself up to me. She was becoming my friend. After leaving the school, I entered college and, eventually discovered love. And, believe me, it was my maa who was the first person to know about it. She was no more a stubborn parent, but a compassionate friend in whom I can confide. This transformation didn’t come all of a sudden, it took time, but it did happen. Now, as I’m a mother now, I can understand the reasons for her primary obdurateness. It helped me to become an honest person with good manners. Now I can realize why she never encouraged me to pick flowers from the neighbor’s garden; why she scolded me when I borrowed a book from the library and never bothered to return it. Her every word now reflects my present action as I’m behaving in the same way with my kid. All she wanted was to instill tradition, faith and honesty in me. And, I’m just following her path. She was #MyFirstExpert even when I failed to understand it. Now, as I’m married and live away from her, she calls me at least twice a day. Once, to know if everything is well at my workplace and household and, secondly, to inform me that all is fine at her place. Yes, the role has reversed; as I think, happens with every daughter and mother. We are now on the same level. But, still I don’t know why when my son fell from the stairs and got badly hurt, I called her not only to get the expert advice but also to sob uncontrollably. I can realize exactly where it hurts when children are injured. Maa, forgive me for not understanding your feelings at times; for shouting at you when you said ‘no night-out with friends’, for throwing all kinds of tantrums when you asked me to gulp down a glass of milk….now I know, I know for sure your feelings. Thank you for teaching not only the alphabets but also the lessons of life. Thank you for bringing me to this beautiful world. If I have done anything in my life that deserves an appreciation, I have inherited the grain from you; my mother, my home, and heart, #MyFirstExpert. This is tribute to the first most beautiful teacher. This is a heart-touching post. The relation between a mother and child and the mutual feelings they share have been well narrated. This post was well written, it came from the heart and had universal appeal to parents and children. I am sure your mother is proud of the woman and mother you have become. I look forward to reading more. Enjoyed your post about mother/child relationships. What a rewarding friendship that develops unexpectedly. My mom was like you – strict when I was growing up, but later she became my first friend. A heart warming read, Maniparna. As a mother, you have poured your heart in it. Even I want to say sorry to my mum. Well, I do it very often from couple of years. Indeed, a mother is possibly the best evidence that there is a higher Power and Self out there. The evidence of Selfless love. The evidence of a Guide, Mentor and Well wisher. The evidence of being there always, waiting for your return. The evidence of forgiveness. The evidence of Empathy. The evidence of powerful listening. The evidence of …….. The list goes on and on. Your post took my thoughts to an old B & W photograph I had seen decades back. Of a photo of an aging parent and a child. With the caption. ” Hold my hand as I once held yours.” To me, this signified the meaning of life more than anything else. Hi Shakti, your comment is so touching, it made my vision glassy. Thank you very much for leaving such a heartfelt comment. Welcome to my blog….I’m honoured to have a reader like you… :-)…. The mother-daughter relationship reflects well in your writing. It’s the unconditional love of mothers that makes the world a lovely place to live. A nice campaign from Godrej to celebrate Mother’s day. Beautiful initiative by Godrej and you’ve written this so nicely. It brought back all my memories with my mom. 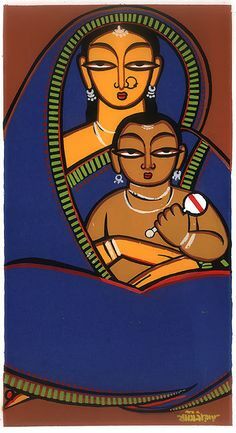 Lovely post n a lovely Jamini Roy painting u used here! You have well written a grown up daughter’s feelings towards her Mother…. Very inspiring Post! Wonderful Maniparna – loved the writing in this piece. Beautiful tribute. Such an open, honest tribute, it makes me smile to not only get to know you more but also to have insight into your mum and your relationship, so heartfelt. I wish I could write in the way you can but I am happy to be a reader of those words you bring to us in such style. As long as you keep writing I will be happy my friend, I’m glad my comments inspire you, as you inspire me also. Hi Maniparna , I was thinking that there are not enough words in thesaurus to express mother’s love and encouragements , but your post proved me wrong. Superb. All the best always. I recollect one of the sayings of Ramkrishna, when asked by devotees, if it is possible to see God…The crisp reply, if you can match, in your prayers, the unconditional love of a mother towards heŕ child, you can see….Mothers are just like that, handholding in every step of life, unconditionally…….Beautifully penned! What a strong bond both of you share! Sorry Amy, I can understand how much pain it might be to have a disturbed childhood. You’ve such a blessed soul and one of the loveliest minds I’ve ever come through. I know you for a few days, but your words always exude calmness and peace …they make me feel happy and positive. Its a beautiful bond Maniparna :). Its amazing how strong an impact they make in our lives and continue to be so. The only kind of unconditional love I guess which makes life very pure, pristine.. Very touching post. Well, I can say that your mother is more beautiful than many leading actresses in the movie industry. I’ve seen her pic. I’m in the same position as junior Anjali in Kuch Kuch Hota Hai when she was on stage to say a few words on her mother. A beautiful tribute to your mom Maniparna. The strictness in the formative years is something I could relate to very well both as a daughter and as a mother. But the most beautiful part is that now you realize how it has helped you to be the person you are. Best wishes for the contest. What a lovely tribute to your Mom. It took me a lifetime to truly understand and appreciate my own mother’s strict style parenting. Adulthood brought the realization that her motivations were for my future. She was enabling me with the tools I would need to be a person who could contribute positively to world. I love your candidness and love for about and for your mom. Blessings upon you both. Thanks TIna. Your words truly are reflecting my thoughts. It really needs for daughters to understand mothers’ intention. As we grow up, we can relate to their thoughts and motivation. A a touching and beautiful post Maniparna 🙂 I so love the way you described the transition of her being strict to compassionate friend…emotions laid clearly in words babe! Beautifully written…we understand our parents better only when we become parents…..
That made me emotional. .. It is so lovely to read especially in today’s world when everyone has become to busy.. Loved reading the post mam.. So well written. All the best for the contest! Found near the dustbin made me laugh a lot. It’s a common thing that Indian kids somehow think. 😛 Actually no one understands why elders say certain things until they are there. So no use blaming yourself on that. Finally there is a typo when your son…. Check it out 🙂 Good luck for the contest. And, finally, a mere thanks will not be enough for pointing out the typo….it was a bad one…. 🙂 That’s what friends are for… THANK YOU…..
A beautiful tribute to you mother and a lovely reminder for all of us to understand and acknowledge the selfless love of mothers before it is too late. Thanks a lot… 🙂 It was kinda emotional outburst… 🙂 glad you liked it…. I enjoyed it very much. It did strike me as emotional, strong but eloquent. Perhaps it felt to you like an outburst, but when your feelings reached the page they came across to me as well measured.